A $500 security deposit is required with this reservation and we may process a credit card authorization in that amount prior to your arrival. A charge may result for damage to the condo or contents, missing contents, excessive cleaning required after checkout or for exceeding the maximum number of overnight guests. We allow a maximum of 6 overnight guests. Some exceptions will be made for additional children. Please contact Bonnie-Kay Calder at 808 345-2691 to discuss these exceptions. With more than 4 guests a $15.00 fee per addional guest is charged per day. Falsely representing less guests than are actually staying will result in loss of all deposits and immediate eviction. Check-in time is 3 PM and check-out time is 11 AM. Please be certain to plan your arrival and departures times accordingly. An early check-in time or a late check-out time may be available and is subject to a fee. Please contact Bonnie-Kay (BK) 808 345-2691 for more details. Central air conditioning is available at a rate of $25.00 per day. If you unselect the charge and decide you want A/C after your arrival, there will be a $75 charge to turn on the unit. Smoking is strictly prohibited in the condo or on the condo lanai and doing so will result in full loss of security deposit & immediate eviction. Hurricane, Tsunami or Storm Policy: No refund will be given unless a mandatory evacuation has been given by the National Weather Service for Kailua Kona and the surrounding area. In the event of an evacuation order is issued we will refund unused portions of rent of a guest currently occupying the property and any advanced rents or deposits collected for a guest that is scheduled to arrive during the evacuation period. High-quality, mattresses ) are installed in this condo and have mattress pads. The full replacement cost of a new mattress (more than $1000) will be charged if it a mattress needs to be replaced due to guest negligence. BaseSEM, is the sole owner of the information collected on this site. We will not sell, share, or rent this information to others in ways different from what is disclosed in this statement. BaseSEM, collects information from our users at several different points on our website. This web site contains links to other sites. Please be aware that we, BaseSEM, are not responsible for the privacy practices of such other sites. We encourage our users to be aware when they leave our site and to read the privacy statements of each and every web site that collects personally identifiable information. This privacy statement applies solely to information collected by this Web site. Our family stayed here for the first time and loved spending every moment possible on the Lanai. Conveniently located near very nice pools and the golf course, it's an easy 2-min walk to see spectacular sunsets every night. The home is very welcoming and you can tell the owners put alot of effort into ensuring the beds are quite comfy. It was hard to leave! 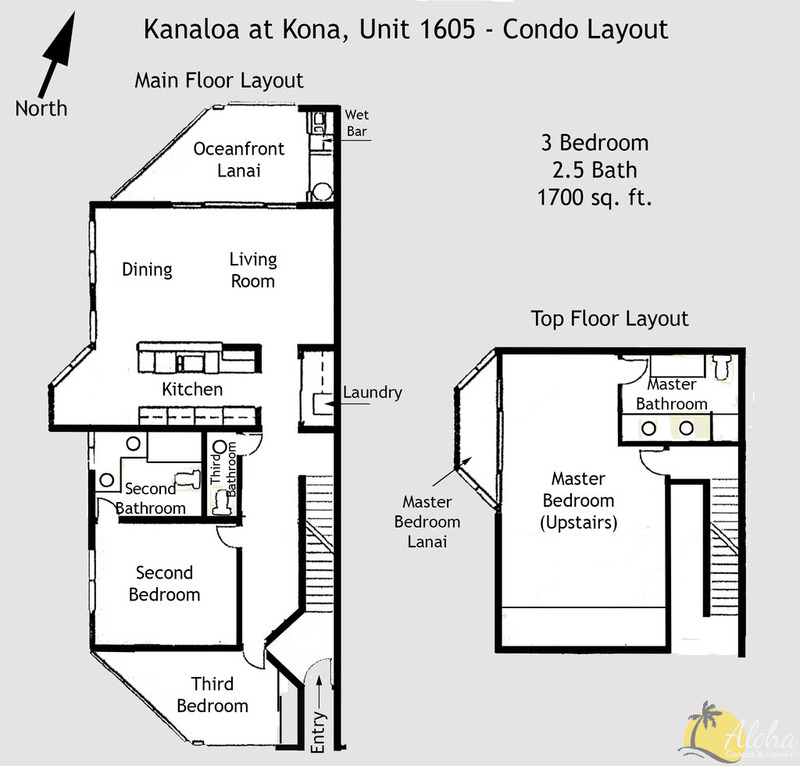 Kanaloa at Kona 1605 is a luxury condo with spectacular oceanfront views; coastline views to Kailua Bay; and sits on the Signature Tee (12) of the Kona Country Club Golf Course. 1605 is on the 2nd floor which has a large lanai, full kitchen, living dining room, Master bedroom suite, office with Murphy bed, and 1/2 bath. Upstairs on the 3rd floor is a Master bedroom suite, expansive walk-in closet, and a private lanai with 180 degree views of the ocean. We welcome you to experience the tropical breezes; sounds of the ocean waves, fabulous sunsets sometimes with even the “green flash” and the fragrance of the exotic flowers. Kanaloa 1605 awaits you! * Sits on the Signature tee (12th) of the Kona Country Club Golf Course. " You might even see a hole-in-one". * Watch the canoes, kayaks, and fishing boats. * Then up 13 stairs to the top floor living area. * Pocket doors open to the large lanai. * Designer table and chairs- seats up to 6. In addition to the fantastic ocean/golf course view, this very clean condo was spacious and had a fully stocked kitchen. Convenient to everything in Kona area, too. The unit felt private given how it was situated within the complex. We had every meal out on the lanai, and saw some amazing sunsets. A definite A++++ ! Our family stayed here for the first time and loved spending every moment possible on the Lanai. Conveniently located near very nice pools and the golf course, it's an easy 2-min walk to see spectacular sunsets every night. The home is very welcoming and you can tell the owners put alot of effort into ensuring the beds are quite comfy. It was hard to leave! We spent 9 nights here with our two nieces and their husbands so the two bedrooms and murphy bed in the office worked out really well. The kitchen was very well equipped with everything we needed. In addition, a property barbecue was conveniently located just a few steps from the front door. The view from the lanai was spectacular and we ate most of our meals outside. There were four beach towels provided, four beach chairs, and some water floaties for the kids. The unit was clean and welcoming. Older family members may have issues with stairs and more stairs. The second bedroom also tends to run quite warm but ceiling fans and freestanding fans in each room help regulate the temperature without air conditioning. Location is very close to a shopping center with a grocery store and the nearby marina was convenient for booking water excursions. Would recommend this unit for families looking for a comfortable, well-equipped, vacation option in a good location.